We’re just six weeks from the first pitch in spring training for the Nats. The Cherry Blossom Festival is eight weeks away. And... none of that helps. You’re about three minutes away from being frustrated with our big snowstorm if you’re not already there. Whenever there’s a big snowstorm, there’s a pattern in the reactions. First there are hints of a big storm and meteorologists flail their arms across their maps telling you what might happen. Then a few days out, we’re all told what probably will happen. Then it happens. The snow falls. There are cancellations and calls to stay off the streets to let first responders do their job. A storm of reporters fan out over the area — ignoring the call to stay inside — to report on the storm’s effects and to relay the government message to stay inside. There are warm stories about neighbors helping neighbors, and tragic stories of wrecks and emergency births and, unfortunately, reports of heart attacks for people exerting themselves with too much shoveling. At first, the news conferences by mayors, county executives and governors are positive and upbeat. Everyone is prepared, but everyone is urged to be cautious. In extreme instances, whole interstates are shut down for safety reasons, as Maryland Gov. Larry Hogan did for I-270. A couple of days pass. The brilliant white snow starts to turn a sickly gray as pollution and road dirt take their toll. Along with the changing color of snow, attitudes begin to change among the masses. They’re tired of staying home. The kids are restless. The big haul of provisions is starting to run low. The snowplow has not made it down this street or that street. But nerves will be on edge, and complaints become the next storm. At the start of the week Mayor Muriel Bowser clearly was anxious to get the nation’s capital back open for business. She announced that the city government would return to work on Tuesday and schools, barring a setback, would open on Wednesday. Downtown, our NBC4 cameras on Monday captured a snowy wonderland of potential misery. Despite aggressive snow removal efforts, many multi-lane streets were barely one. Piles of snow on street corners made it difficult to drive, park or even turn corners. Many private businesses link their leave policies with the District. If it closes, those businesses close. If the city opens, the businesses open. The Notebook is hoping that Mayor Bowser’s decision to get the city moving again doesn’t result in thousands of angry drivers. Your Notebook again drove around Tuesday morning downtown and in neighborhoods, seeing many cleared streets but many multi-lane roadways with one lane open at best. 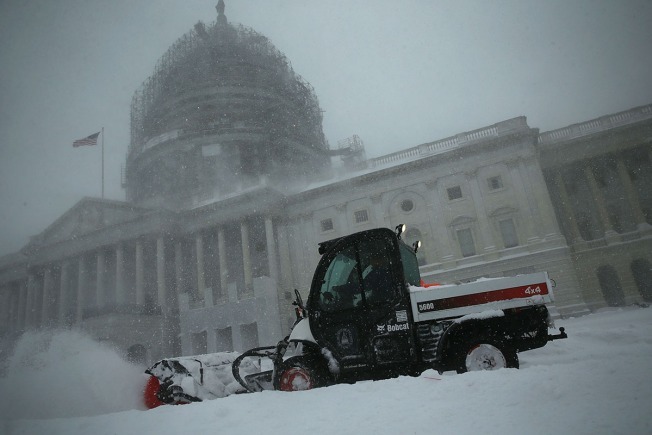 The federal government remained closed Tuesday, a big help for continued snow removal. If all goes well into the weekend, the mayor mostly will be praised and thanked. If it is an ongoing mess, it will become a political storm for the mayor to handle next. ■ A good sign finally. It was late in the game, but the Bowser administration finally got an interpreter for the deaf and hard of hearing on Saturday morning. The interpreter is serving an important part of our community. Our region is more and more diverse, and so should be our outreach. ■ Soccer “stadium.” The reviews are in. And social media has not been kind. Many people don’t like the new D.C. United soccer facility for Southwest Washington. The word “stadium” doesn’t seem to fit too well. It looks more like a couple of old-fashioned grandstands facing each other. On last Friday’s WAMU Politics Hour, D.C. Deputy Mayor for Planning and Economic Development Brian Kenner told us the team committed as part of the deal to spend $150 million on the facility, matching the city’s $150 million investment. It will be interesting to see the cost breakout of the design that’s been presented. A few people say the stripped-down stadium will be perfect for soccer, bringing fans closer to the action. We’re all for fans being closer to the action, but we hope the soccer stadium is better than its first reviews.